Deadfall Adventures is an FPS from The Farm 51 and Nordic Games that adds a twist of puzzles and exploration to differentiate it slightly from all the other zombie/Nazi shooters out there. You take on the role of James Lee Quatermain, great grandson of famed adventurer Allan Quatermain, as he comes to realise that his great grandfather’s writings may not have been quite as unbelievable as he had always thought. The game starts out with a meeting between James and an old acquaintance, Jennifer Goodwin, who now works for a US-funded agency. It doesn’t take long before the meeting in Egypt goes south and the taxi driver runs off with the item Jennifer was holding, having been hired by the Nazis to steal it. The story has James visiting sandy Egypt, the frozen Arctic and the jungles of Guatemala with a good bit of underground sight-seeing thrown in thanks to temples and mining operations so deep that rickety wooden bridges reside over liquid magma. No I don’t know how the wood didn’t instantly combust from the heat either, but there are bigger issues than mere physics when it comes to Deadfall. As a comparison to the likes of Indiana Jones, Nathan Drake or even Lara Croft, Deadfall struggles to hold its own in terms of story, often coming out as a poor imitation rather than something inspired by H. Rider Haggard – arguably the founder of the entire literary genre from which all of the above games sprang. Unfortunately the writing for Deadfall Adventures leaves a lot to be desired which, in turn, presented the voice actors with a tough time pulling off convincing personalities. James is presumably meant to be a lovable rogue with quick one-liners and cheeky comments, but he comes off as being sexist with a huge ego. One liners fall flat and conversations don’t flow between characters, despite the best efforts of the voice artists to add inflection. This isn’t helped by combat or puzzle situations where just a couple of lines have been recorded, so the characters repeat them over and over and over and over….and over. If I have to hear “Still think I’m a rookie?” one more time I’m liable to start rocking back and forth, trying to tear my own ears off, before sinking into a catatonic state. The sad thing is, a game that trades heavily on the back cover about its literary and then consistently fails to deliver a good story needs to be a damn good game in all other respects to make up for it – Deadfall Adventures is not one such game. It mixes puzzles with FPS but doesn’t manage to pull off either side of its split personality with finesse. Story-driven FPS adventures such as BioShock or Dishonored have kept me glued to the action with slick combat and interesting abilities/gadgets to mix it up. 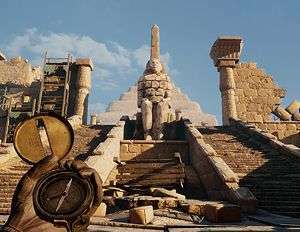 Deadfall attempts to mix up the action by allowing the player to use the traps and environment against enemies. In execution it is usually quicker and easier to just shoot the bad guys down rather than hoping they’ll trot out of cover and through the trap’s hot zone. Although there was one section where I had previously had some of the floor fall away into a spiked pit and genuinely belly-laughed when the AI sent every shambling mummy straight at me, which resulted in all of them falling to their deaths. The AI isn’t particularly clever, mummies will run straight for you whereas gun-toting enemies will generally stay back and shoot/grenade from cover while shotgun-wielding foes will try and close in. The AI has a little assistance in the form of the combat mechanics. Most guns have iron sights when zoomed, and there is even a sniper rifle in the mix, but they all have ludicrous recoil and most are inaccurate at distance. The accuracy, or lack thereof, for the UI cross-hairs (due in part to the levelling-up system) is a bit of a joke, and the red highlight to indicate a clear shot on the target will lie at times. Taking the sniper for example, I’ve had clear hits on headshots that never registered yet also seen bullets hit their target when the reticule wasn’t showing as red. Collision detection and clipping of the environment is pretty shabby, but thankfully there is usually plenty of ammo or gun-swaps around to have another go when you are cruelly declined a perfectly aimed kill. There are also instances when the bad guys go down and then spring right back onto their feet again after a couple of seconds, so adhere to the Zombieland rule of double-tap to the head – or, in Deadfall’s case, see if the reticle stays red and if they react to more bullets. The lack of differentiating animations between dying and falling down wounded is just one of a number of lazy shortcuts taken graphically throughout the game. There is a knife for melee kills but it’s best not used unless in a dire emergency. If you are reloading and an enemy closes in then you cannot cancel that animation to quickly dispatch the opponent with your dagger, oh no, you have to back away praying that the reload will be over and by that point you may as well just shoot them. For all intents and purposes the knife is pretty much pointless. In an effort to add something different rather than just relying on a 1940’s arsenal seen before in too many FPS games to count, Deadfall Adventures has a torch. Not just any old torch mind you, a special torch made from Atlantian metal! With the torch equipped on your weapon (taking the place of the left gun if using pistols) you can use it to blind enemies by shining the light in their direction, which is pretty handy against a clump of Nazi or Russian soldiers who would make short work of you if they all fired at once. The torch has a second skill too – when fighting undead enemies you can ‘zoom’ the torchlight which will ‘set fire’ to the enemy and make them vulnerable to bullets (as, without being hit by the torch/explosives, undead enemies are pretty much invincible). I know what you’re thinking and, yes, it is a direct theft of the mechanic used in Alan Wake. Deadfall Adventures isn’t just about shooting though, it’s also about puzzles. Every level will have a few things you need to do or work out in order to progress. James has his great grandfather’s notebook which inexplicably has hints on every puzzle you face – even one regarding cranes that I highly doubt would have existed during Allan Quatermain’s own adventures. Four out of five times the notebook will give you your answer in handy diagram format and to puzzles that you could have worked out anyway in next to no time, but there were a couple that stumped me for a while and it was at those really random points where the notebook proved to be as useful as a chocolate teapot. The crane example above was one which took me ages to work out, and the all-knowing notepad was useless. In addition to the main puzzles, and in the true spirit of an adventurer, you are on the lookout for treasures, and in Deadfall that is how you level up your character. There are three types of treasure that will upgrade either James himself (his health/stamina), his combat prowess (accuracy/reloading time) or the flashlight (damage/speed to set alight undead). There are at least 100 collectible treasures but the game throws you some aid in finding them. First you have a compass, much like that of Captain Jack Sparrow from Pirates of the Caribbean – it spins constantly until you are near a treasure and then it’ll point you in its general direction. Each treasure you collect will pull up a tally screen to help you keep track, but beady eyed players will find maps on most levels that list the collectibles. Unfortunately the maps are poorly presented and rarely actually mimic the environment or room layout. Instead it offers a very linear guide to the treasures, so that if I picked up a treasure and one before it wasn’t circled it meant I’d missed it. As the game regularly blocks off previous passages and paths as you progress, you are unlikely to get all collectibles on a first playthrough – it took me an entire level to even work out what the map was all about as nothing married up with where I was finding things. It is also with these collectibles that the most irritating part of the game was revealed – you cannot save at will. The game checkpoints itself at regular intervals but not upon collection of treasures, which means that if you die you have to go back for all previously collected treasures since your last checkpoint. Due to the first-person nature of the game it also means that some puzzles are needlessly frustrating. Floors giving way or needing to stick to a set path is always tough when you can’t see your feet, even tougher when a small pebble becomes invisible wall that you bounce from and tumble to your death. There is one point where debris rises to the surface of a pool for a short while before re-submerging. The aim is to jump from piece to piece, but it was tricky, too tricky, and in the end I was so fed up of having to go and get the other treasures every time I failed it that I just left it behind and moved on. Graphically, Deadfall is quite pretty, especially the jungle sections, but even then it has its flaws. Built using the Unreal Engine, there are points where scenery disappears or doesn’t quite mesh together revealing a sky-blue background (even black would have been more convincing – especially when underground). There was none of the typically ubiquitous texture pop-in, but other oversights were made on the art front. 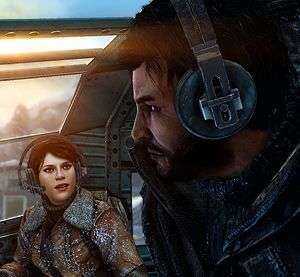 For instance, at the beginning of one chapter you are flying to the arctic and yet the artists couldn’t be bothered to create separate assets for that in-game cutscene so you have snow speckles on your clothing inside the plane! Quite how snow got inside the cockpit and covered you both when you’d not been outside is a real mystery. In terms of sound, the voice actors try their best to deal with the script but if often misses the mark, although the accents of the Nazis is stereotypically bang on and James’ voice actor has a good handle on applying a suitable style and tone to the physical character.. The soundtrack is average at best, with combat music zoning in and out when needed but most of the time you just have the background music on loop with little to no change up of tracks whilst going through a level. 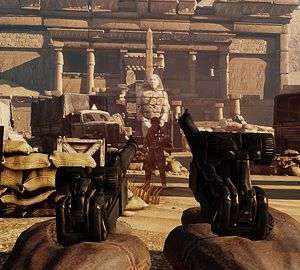 Deadfall Adventures also comes with two multiplayer modes. The first, survival, is a horde-based co-op match for up to four players. Each round pits you against growing numbers of increasingly tougher enemies with supply drops for ammo being dropped at semi-regular intervals. As with the campaign, you will need to weaken enemies with your torch before you finish them off with bullets, and there are traps too, allowing you and your friends to kill with a little creativity if you time it all right. Points are granted for flawless kills, combo kills and so on, but nothing seems to count towards your pvp multiplayer profile, which is a shame. At the end of each wave you gain access to new weapons, such as pistols, and every few waves you’ll unlock new hardware, such as rocket launchers. 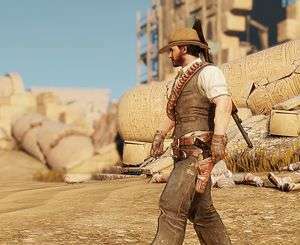 In a move that is almost setting themselves up for a (Dead)fall, The Farm 51 team have included a raft of multiplayer modes complete with classes that must be individually levelled. A fair few achievements are levelled at multiplayer and, despite my best efforts, in the entire time I was reviewing this (even on the day of release) I found not one other person in any lobby for any games I attempted to find and, rather than filling in with bots, you just sit forever on a screen waiting for more players. There are a number modes available and they look to try and do something slightly different, like treasure hunter mode but, sadly, without being able to play it, I can’t comment. I honestly cannot see a reason for multiplayer being shoe-horned into this release, I know the game slipped the original release date, but adding multiplayer when two of the largest FPS franchises known for multiplayer are also released doesn’t make too much sense. I suspect many people will struggle to get a multiplayer game in the launch window, let alone in the weeks/months later – especially at the ‘end’ of a console generation. It seems even more of an odd move when the game is supposed to be about doing something different by adding puzzles, but then having a multiplayer mode that is effectively traditional FPS fare and little in the way of twist. Considering the poorly executed single player campaign, the effort put into creating what appears to be a fairly substantial (but, ultimately, probably rarely used) multiplayer experience could have been better funnelled into making the core game something far better. Puzzles do break up the action even if the solutions are often stupidly easy or infuriatingly obtuse. The script is trying for a B-movie style (I think) but misses the mark, it’s bad and cliché, but not in a clever or funny way. Graphical and physics issues, such as standing in light but with your map/compass shadowed to the point where you can’t actually see them and snow on clothes inside a sealed cockpit during plane flight. 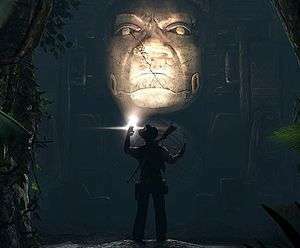 I was hoping for another Tomb Raider, but rather more raiding of tombs than Lara Croft’s latest adventure provided. Instead I ended up playing a game that wasn’t sure what it really wanted to be (such as having to complete a puzzle based on shining your torch at jewels for a few seconds whilst also being pounded on by undead mummies). I really did want Deadfall Adventures to be a win for the smaller developers but I struggled to pick a single redeeming quality from my experience that could be used as justification for recommending this to other gamers. Check-pointed saving, no going back to previous areas to recover lost collectibles, and dodgy collision detection add misery to a game that was, at best, a laborious plod through sand, snow and jungle. Due to multiplayer, this isn’t even an easy run through with a collectibles guide for any achievement hunters after a quick 1000G, and in fact I wonder if anyone will ever be able to max it. Sadly, Deadfall Adventures is a game that attempted to gain a foothold in a genre where there are already well-established heavy hitters and failed. Naughty Dog are unlikely to be watching over their shoulder any time soon. Already a long time since I played this cool FPS as Deadfall Adventures. However, the game needs to be developed. As for me, not enough interaction with the environment. The game is linear. Music in the game is amazing. Issue a strong seven and I look forward to the second part with more difficult puzzles.